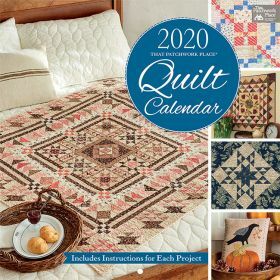 Now in its 18th year of publication, That Patchwork Place's quilt calendar is a favorite of quilters worldwide. Show off a love of quilting year-round and enjoy sewing along each month too: the calendar spotlights 12 swoon-worthy quilts plus a 28-page pullout booklet that includes complete directions for making each project. Chosen from recent best-selling Martingale books, the featured quilts come from much-loved designers including Lissa Alexander, Betsy Chutchian, Kim Diehl, Carol Hopkins, and Stacy West. Whether it graces the kitchen, office, or sewing room, this perennial favorite is perfect for ringing in a brand-new year with gorgeous quilts.